The following article is a commissioned contribution to be published in a book edited by Dave Breuer of Anew New Zealand. As most New Zealanders are quick to acknowledge, New Zealand has established – in its relatively short history – one of the most effective democracies in the world. The record is indeed a proud one. Universal suffrage, votes for women, equality before the law, the welfare state, human rights, race relations, are all areas where New Zealand has been amongst the pioneers of reforms which the rest of the world has been keen to emulate. Yet even this proud history is not sufficient to guarantee to us a fully functioning democracy, one capable of equipping us to face and overcome the increasingly evident and serious challenges to our well-being and even survival, both here in New Zealand and across the globe. My fear is that without that robust and effective democracy, we – and others – will fail those challenges. My vision, on the other hand, is that New Zealand – true to our distinguished traditions – will find the means to restore a democracy effective enough to ensure that the challenges are met, both for ourselves and for others to follow. The essential value of a democratic system of government is that it counteracts the natural tendency of all societies to allow and indeed promote the concentration of power in just a few hands. Left to themselves, most societies will operate so as to advantage the strong, the wealthy, the intelligent, the well-born, or even the plain lucky, who will then use that advantage to entrench and increase their power still further, to the detriment of others. The crucial decisions that are then taken will be made in an increasingly narrow sectional interest – that of the rich and powerful – rather than in the wider interest of the whole of society. The great virtue of democracy is that it provides a counterweight to this natural tendency, by ensuring that political power at least is more fairly and evenly distributed, and that there are therefore certain limits as to how far the powerful can pursue their own limited interests without regard to the interests of society as a whole. But what should we make of an apparently democratic system of government where power has indeed concentrated in just a few hands and where that concentration has occurred in places that are beyond the reach of our elected government? Should we say that we are content that we have the forms of democratic government, even though the substance has been hollowed out so that our elected government cannot ensure that they take important decisions in the general interest and are accountable for those decisions to the whole of society? My contention is that this is exactly the dilemma we face, and that neither in New Zealand nor elsewhere do we have a functioning democracy such as to protect the wider public interest – now and into the future – against the accumulation of power into fewer and fewer unrepresentative hands. This is a situation fraught with danger. How has it come about? It has happened because the wealthy and powerful have discovered a means of circumventing elected governments. Whereas once, an international investor (and in a global economy, it is the international investor who holds the most important purse strings) would have to comply with the requirements of the government of a country in which it wished to operate, now – by virtue of the unlimited movement of capital across national boundaries – the boot is on the other foot. A government which does not toe the line, in terms of what is wanted by a potential investor, will simply be told that the investment will go elsewhere. Few governments have the power or will to defy this blackmail. Most will meekly comply, to the point that a measure that is regarded as likely to deter overseas investment will never see the light of day, let alone be put in place. The result is that the ability of governments to protect and advance the interests of their citizens has now been significantly diminished. And, as people sense that their governments have lost power, they in turn lose faith in democracy. 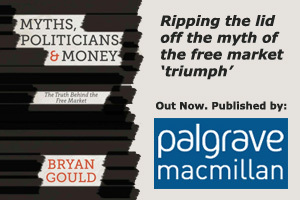 So, economic policies are framed to satisfy current orthodoxy, so that central economic decisions are taken out of the hands of elected governments and handed over to unaccountable bankers and officials. Policies are shaped to meet the needs of big business, tax rates for the wealthy are progressively reduced, spending on social and environmental issues is pared back, rules restricting the repatriation of profits are relaxed, the protections provided to workers are weakened, the fruits of prosperity accrue largely to the already wealthy, rules to protect the environment are bent, restrictions on cross-media and foreign ownership of the media are abandoned. None of this happens openly – as an acknowledged consequence of the preponderance of one interest over all others – but is done piecemeal, each step part of an inexorable reduction in democratic protections against the overweening power of international capital. Without our realising it, the political landscape has changed. A political revolution has taken place without a single vote ever being cast for it. The choices offered to voters have been narrowed. It is now the undemocratic global market, not political democracy, that makes the important decisions. A single global economy and market is, by definition, one in which there is no role for government, democratic or otherwise, since government intervention would mean that the market operated differently in one country as opposed to another, and there would no longer therefore be a single market. The danger is that – left unregulated – that single market does not recognise the public interest. It rewards instead the greedy and short-sighted minority. It is not only the domestic political agenda that has been transformed. The dominance of increasingly unrepresentative and powerful international investors – narrowly focused and short-sighted enough to believe that their wealth and power allows them to ignore the threats that assail the rest of us – means that the undemocratic distortion of the political process now has wider and wider consequences and increasingly affects global issues. In matters like global warming, or religious tolerance, or third world debt – all arguably central to our very survival as a species – it is not humanity’s, but international capital’s interest that prevails. This barely remarked yet profoundly threatening development presents all of us with a huge challenge. New Zealand, which has so often led the way to democratic reform, has the chance to fight back, not just in the interests of our own democracy, but as a beacon light for others to follow. Never has the need for democracy, for the broadest possible basis for critical decisions, been so pressing. So, what can we do? Our main task is to restore a fully functioning democracy. We can begin by raising the level of awareness, so that people understand what is happening, and how high the stakes are. We can then demand from our politicians that they reclaim for us all the power that they currently pretend they have – the power to make the important decisions in our interests – and that they meet the obligation to be held accountable for those decisions. We should assure them that they will have our support if they have the courage to take on these challenges. We should consciously rebuild a sense of the value of our democracy, not in the abstract but as a practical guarantor that decisions will not be taken over our heads by distant, unrepresentative and irresponsible forces. That means, among other measures, having the courage to insist that our governments restrict the freedom of overseas investors to buy up whatever they choose, so that we cease to have any say over what is done in our own country. It means reclaiming the freedom to set our own requirements as to how and in whose interests our economy should be run, and what laws should protect our citizens, so that those wishing to operate here comply with our wishes rather than the reverse. It means placing economic policy under the control of our elected governments rather than bankers. It means acknowledging that governments have a vital role in identifying important issues and acting to deal with them, rather than leaving them to the global market to decide. As we begin the fight-back at home, we should also work with other like-minded countries and governments to change the way in which international financial institutions work, to establish rules to govern international investment, and to control the flows of capital so that the power of international capital to defy and override elected governments in their quest for profit at any cost is limited.. We must ensure a fairer distribution of capital around the world and promote international cooperation in the interests of humanity rather than of maximising profits for a few. My vision for New Zealand is not a pipe dream. It is rooted in our history and in our attachment to democracy. What is needed is the political will – and a sense of urgency.